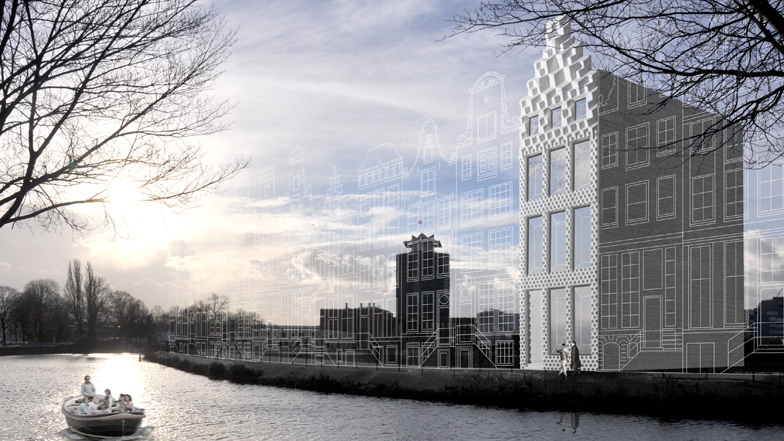 When DUS Architects announced plans last year to 3D print an entire canal house, the design world was skeptical. But all skepticism vanished recently when they unveiled the first 3D-printed walls to the public in Amsterdam. During the unveiling, the firm showcased a set of 3D printed plastic pieces that will lock together to build the canal home’s façade. In addition to demonstrating the possibilities of 3D printing with different materials, the project provides a tangible example of the next-generation technology that may well spur a whole new housing trend. DUS Architects decided to put their plans to the test in the public realm along the canal. Using a 20-foot talk 3D printer called the Kamermaker (or “room builder”), the designers printed oversized honey-comb textured chunks, that would fit together like Lego blocks. Each L-shaped wall chunk takes the Kamermaker a week to print, slowly building up layer upon layer to shape corner and wall pieces. Massively heavy and durable, one piece can weigh around 400 pounds. The pieces, which are mostly hollow, will be filled in with insulation foam to create a solid mass that can keep temperatures comfortable inside the home once pieced together. 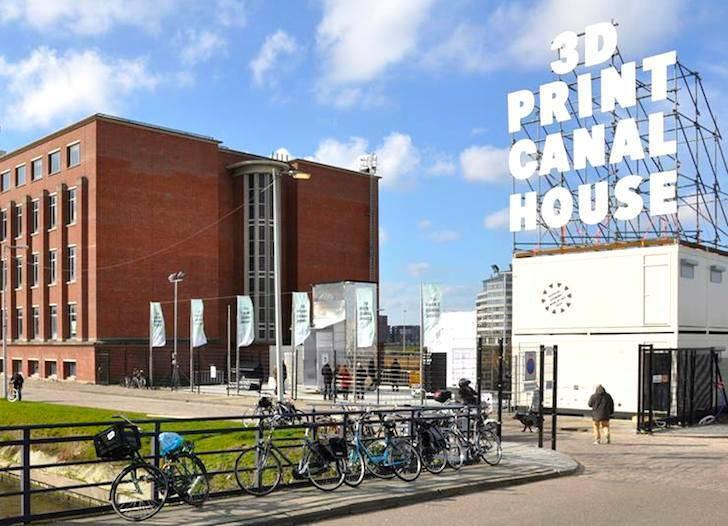 Over the next few weeks, DUS plans to use different printers and materials to 3D print their canal house design. The will also be inviting guest manufacturers to show off their own versions of the design with their own components. Visitors can peruse the 3D printed pieces along the site, which is being treated like a pop-up museum (and charging a nominal 3 euro fee).